Some things are hard to grasp – Einstein's theory of relativity, for example, or the endless mystery that is cat psychology. Then we come to bicycle turn signals, an ostensibly simple system that a lot of people don't understand. I've witnessed many altercations involving cars and bikes, and more than a few involved misunderstood signals. A driver who nearly mowed me down on my prized carbon-fibre bike a while back leaped out of his car screaming that I hadn't signalled. In fact, I had signalled, but the driver didn't realize that bicyclists indicate right turns with their left arm. He wasn't alone in his failure to comprehend bike signals. 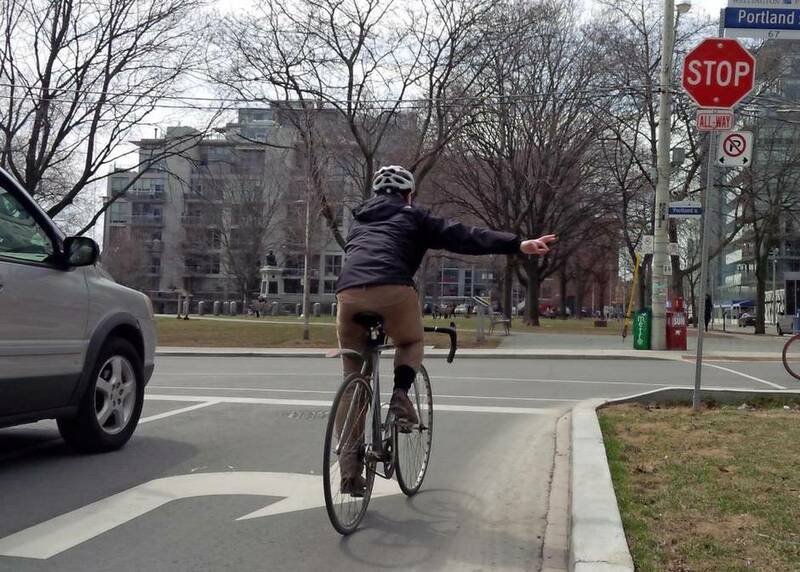 A lot of drivers are mystified by bike signals, which are based on configuring your left arm three different ways to indicate turns and stops. 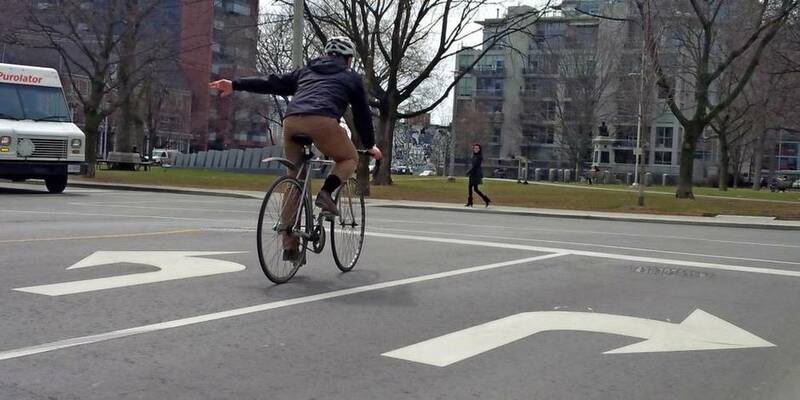 It’s time for the old-school bicycle signal to die. My proposal: a foolproof system that strips away the cognitive dissonance built into the current set-up. In other words: Point in the direction in which you want to turn. If you’re turning left, stick out your left arm and point left. If you want to turn right, stick out your right arm and point to the right. If you want to signal a stop, drop your left arm straight down with the palm open (the open palm is a universally understood symbol). The old-school bicycle signal has roots that reach back to the earliest days of motorized transportation. Early automobiles didn’t have turn signals (one of the most common modifications made by Ford Model T restorers is the addition of electric turn signals). They couldn’t reach across the car to stick their arm out the passenger window, so all signals had to be performed with the left arm (in countries where they drive on the left side of the road, such as Britain, drivers used their right arm instead). Although a few inventors tried patenting electronic and mechanical turn signals in the early 1900s, they weren’t offered on cars until 1939 and didn’t gain widespread acceptance until at least a decade later. Today, the electronic automotive turn signal is universal. It is also intuitive: The right blinker indicates a right turn and the left blinker indicates a left turn. Imagine if electronic turn signals worked like bicycle signals: There would be a single signal, on the left side, that would blink in different patterns to indicate a right or left turn. Confusing, right? The rise of easy-to-understand electronic turn signals has gradually killed our understanding of hand signals. These are rapidly becoming a lost communication form, consigned to the dustbin of history along with Morse code, smoke signals and the coloured flags Admiral Nelson used to communicate with his fleet at the Battle of Trafalgar. There have been numerous suggested solutions to the bike-signal problem. You can buy battery-powered signals that bolt to your bike, for example. These are far from perfect. Your once-elegant bike is now festooned with wires, switches and electronic components. 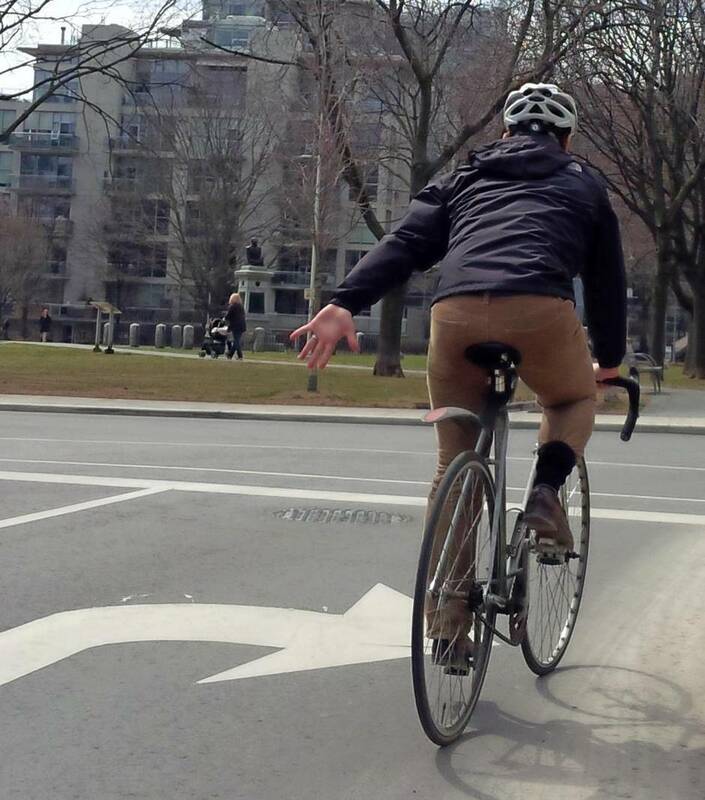 Unlike a car a bicycle is narrow, so the turn indicators are close together, making them harder to interpret. The system is exposed to water, making it likely to fail. And you don’t get a brake light. Some young inventors have proposed systems that run off a smartphone and use accelerometers to determine when you’re braking. Instead of pushing buttons to activate the turn signal, you can use voice commands. This type of system also comes with a host of problems, including excess complexity. As history has shown, the most successful designs are as simple as possible. So let’s forget all the electronics and go with my suggestion – use the arm on the side you’re turning toward, and point to where you’re going. You’ve probably heard of the KISS (Keep it Simple, Stupid) principle. This is KISS at its finest. You can turn in two directions. You have two arms. Use them. Problem solved, with zero extra equipment, no chance of mechanical or electrical failure and a signal that anyone, anywhere will understand. Solutions don’t get better than that.